Oh sweet potato. Did anyone else grow up thinking these things were the worst? We didn’t even serve sweet potatoes in my family, but the horror stores of this orange vegetable covered in marshmallows haunted our Thanksgiving food discussions for years. As a kid, the idea of eating a candy covered vegetable, of all things, just seemed… wrong. In fact, it wasn’t until many many years later that a somewhat sweet potato obsessed friend was able to change my mind. It was in a small bakery on the southwest side of the delightfully weird Portland that my childhood friend quite literally forced a bite of sweet potato doughnut down my throat, and the rest, as they say, is history. I was in sweet potato heaven (although I still draw the line at fries… sweet potato fries are just… weird…)! Seriously Mumsie and Pappo, what have you been keeping from me all these years?! And speaking of parents, today just so happens to be Father’s Day here in Norway. Side note: did anyone else realize Father’s Day does not, in fact, occur on the same day the world over? Four years in and I still forget Father’s Day is in November in Norway. Every. Year. My Father-in-law is a less sweet, more spice-loving sort of cake guy so a sweet potato cake seemed just like his cup of tea… or cake. 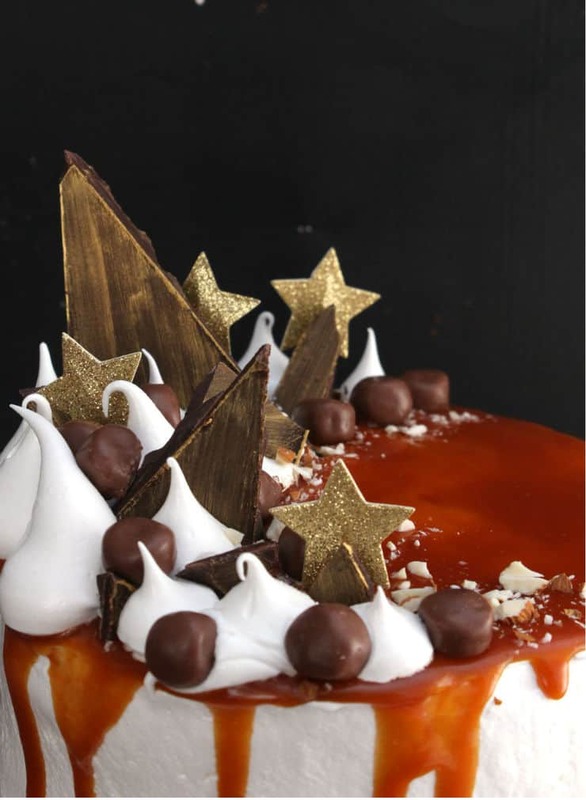 And, for those of you that have been following my blog will know, I love baking things for the Norwegians that push them out of their culinary comfort zone… “You put WHAT in this cake? !” or “Wait, that’s edible? !” (usually referring to some sort of decoration… gross or just generally impressive) are some of my favorite responses. And sweet potatoes in a cake are definitely outside of their norm. It’s ok, though, I’m the only sister/daughter-in-law in the family so they have to love me. Also, I always bring cake so they REALLY have to love me. If you have sweet potato puree available to you, then you can skip this step. If not, you can make your own using 2 medium-large sweet potatoes. Scrub your sweet potatoes, poke a few holes in them with a fork, and bake them at 350F/175C for 1-2 hours, or until tender (can be tested with a fork). Once the sweet potatoes have cooled enough to handle peel off the skin and puree them in a blender. Preheat your oven to 350F/175C and line the bottom of two 6″ cake pans with parchment paper. 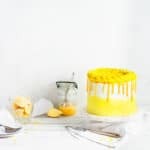 In the bowl of a stand mixer, whisk together your two eggs and the granulated sugar for the cake until light and fluffy. Whisk in the milk and melted butter until just combined. Gently fold in the rest of the ingredients, and divide your batter evenly between your two pans. Bake for 35-40 minutes, or until a toothpick inserted in the center comes out clean. 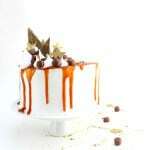 Allow to cool in the pans before turning out, wrapping up, and refrigerating them (cold cakes are easier to work with). Once the cakes are cool, divide each layer in two for a total of four layers. 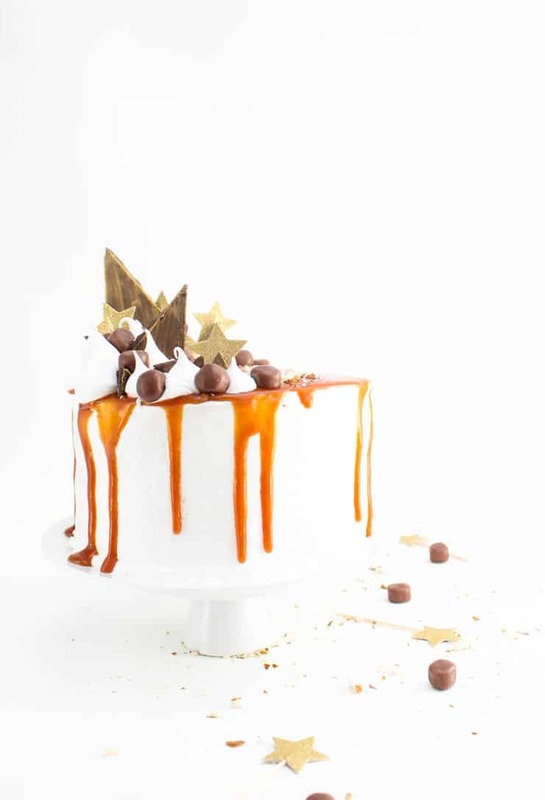 Because you want the caramel to be cool when you’re ready to use it, it’s a good idea to make it next. In a small saucepan, heat the granulated sugar over medium-high heat stir constantly until completely melted and lump free. Add the butter (being careful not to let the caramel splash you) and continue cooking and stirring until the butter is melted. Add the heavy cream and allow to bubble for an additional minute, stirring constantly. Remove the pan from the heat and allow to cool completely. To make the frosting, whisk together the egg whites and granulated sugar in the bowl of a stand mixer over a pot of boiling water. When the mixture is hot and the sugar is dissolved, transfer the bowl to the stand mixer and whisk on high until soft peaks form and the mixture has cooled. Add the vanilla extract and continue whisking until stiff peaks for and the mixture has reached approximately room temperature. 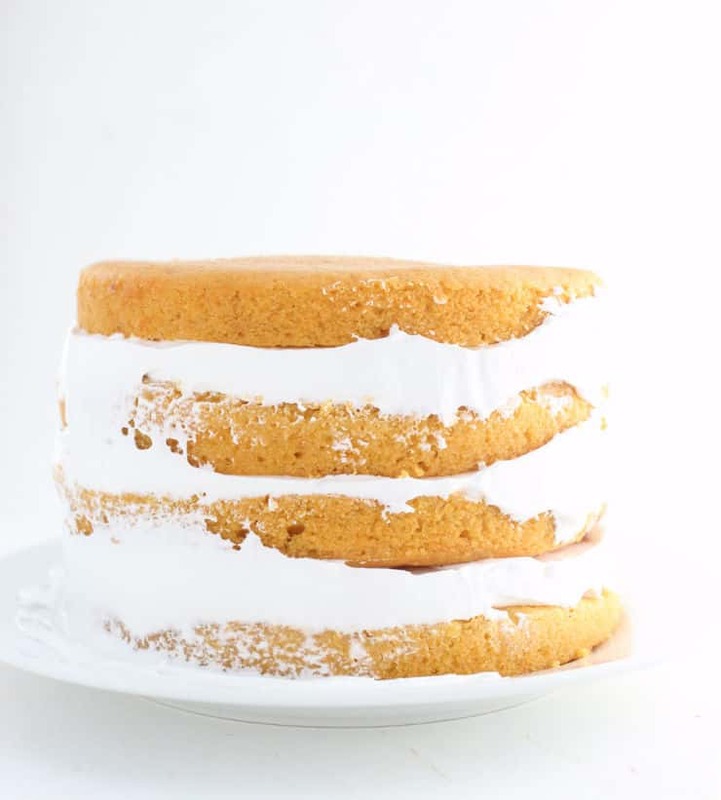 To assemble the cake, alternate between layers of sweet potato cake and thin layers of frosting. This frosting is meringue based and not very strong, so to keep your cake stable, you don’t want to add too much between each layer. Frosting the top of the cake using an offset spatula and down the sides. 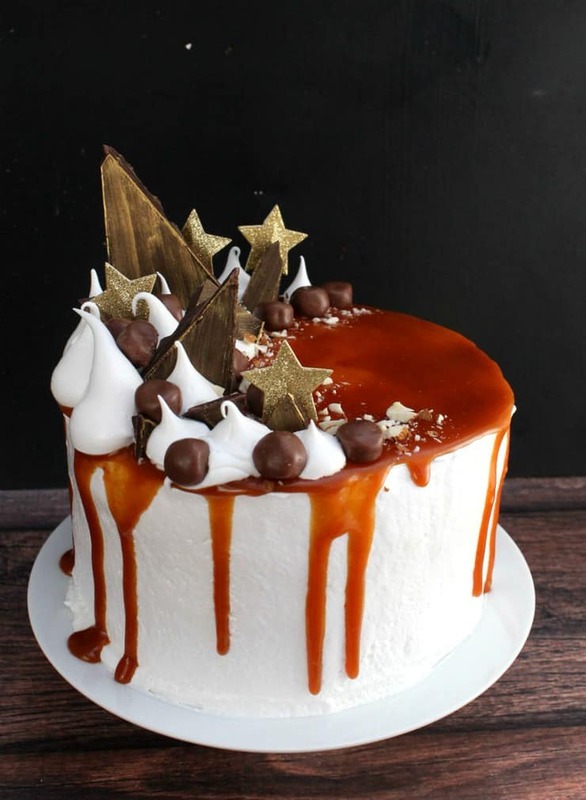 Refrigerate the cake for about 10 minutes so the caramel won’t run so quickly down the sides. 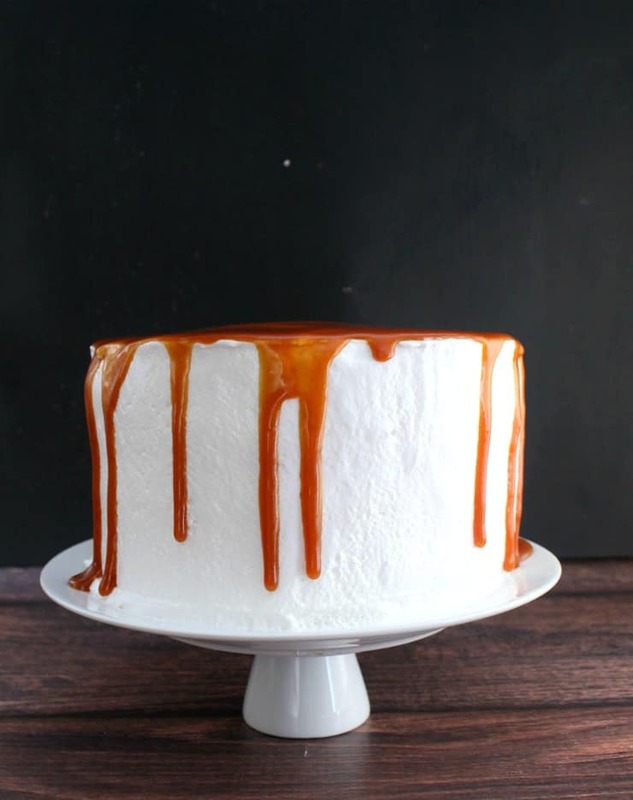 Heat your caramel just enough so it’s not too thick (about 10 seconds in the microwave) and gently pour it over the top of the cooled cake. You’ll want to cover the top with a thin layer, but don’t worry about pushing it too much over the sides; it will naturally drip down the sides but takes about 10-15 minutes to really get there. 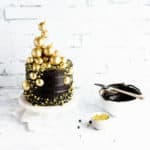 Garnish the cake with an assortment of leftover frosting, chocolates, or anything else you might have on hand. This cake is the bomb! So beautiful! I’m sure you father-in-law felt in love with this cake! I definitely think I changed a few minds about sweet potato baked goods among the Norwegians here. 🙂 Mission accomplished! 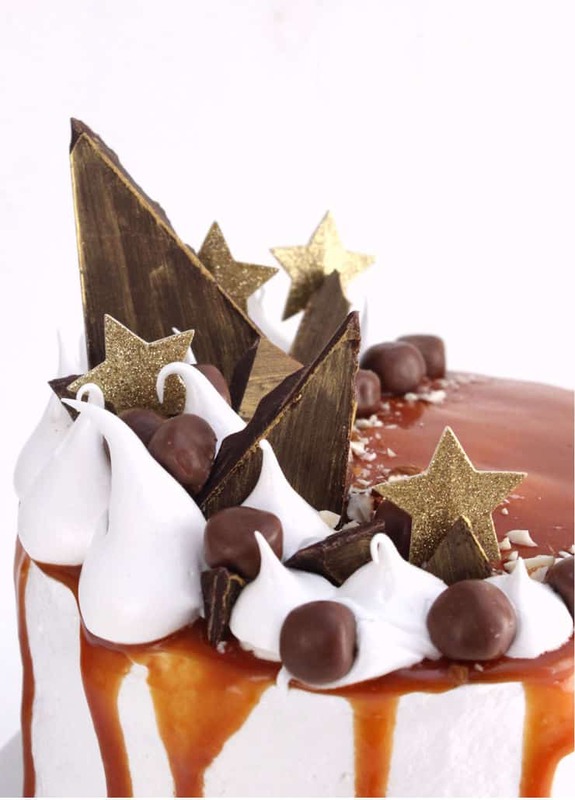 Your sweet potato cake looks absolutely divine, I just love everything about it! 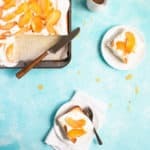 I too didn’t get the idea of sweet potato until I had it in cheese cake form, then I tried actual sweet potato and I was like… holy, I’ve been missing out! Beautiful cake! It sounds absolutely delicious as well! Thank you Claudia! 🙂 Between the sweet potato and the stuffing (particularly the stuffing) I think I’m making culinary points here in Norway. 😉 Although the best part, by far, is showing up at family gatherings with a cake and watching my 5 year old niece throw her little hands in the air and yell, “CLAIRE BROUGHT CAKE! !” and then pulling up a chair to “guard” it. I love how you’re bringing culinary diversity to Norway! Pretty soon they’re going to be begging you for saurkraut cookies or pickle doughnuts. 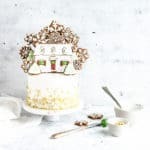 🙂 This cake looks fantastic and I am obsessed with the way you decorated it! Thank you Elizabeth! I introduced my husband to dill pickles last time we were in the States (what they have here is closer to sweet pickles) and he declared them thoroughly too sour. But stuffing… Oh how they LOVE stuffing. Next on my list of things to introduce them to: cranberries! Um…..I’m drooling over here. I have never had a sweet potato cake, but I wouldn’t hesistate to try a slice of that. It looks amazing. And the decorations, I mean…come on! Beautiful!